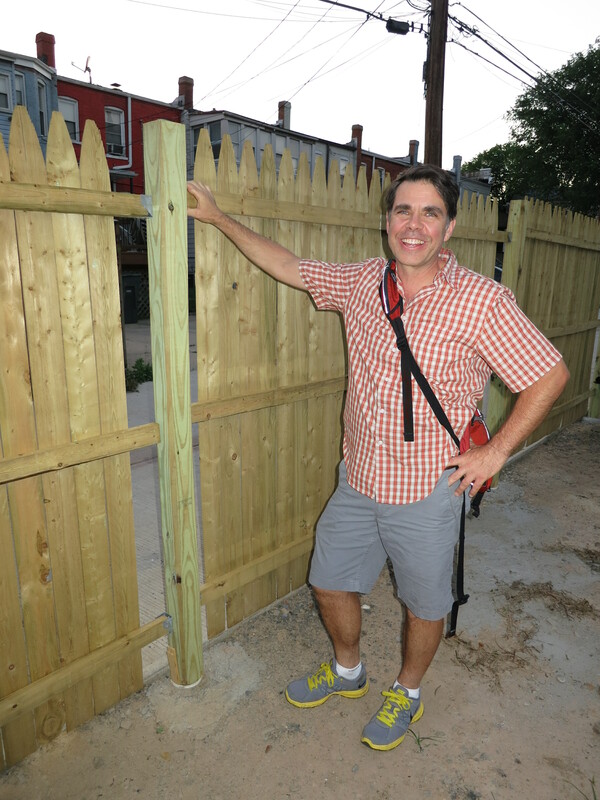 lot update (early june): fencing, electricity, compost, fruit trees! Some pictures from the lot taken over the past couple weeks – Brian and Tony are almost done with the fencing, compost was delivered, garden beds are being built, and some of the fruit trees are planted already! Plus, Brian installed his birdfeeder and hammock hooks are going up soon. Lee returned from Brazil excited to see all the progress made on the lot. Tony is off to South Carolina next weekend to pick up her tiny house shell and trailer. Brian and Jay’s trailers are parked and waiting to be built. Brian picked up a bunch of sixteen foot sections of hog wire fencing from a farm supply store near Baltimore- this will be used to finish up the fence. We got it to fit in the 17′ Uhaul, barely. We thought we could save time digging fence post holes with a gas powered augur. Within 10 minutes of fruitless battle with rock and concrete, we realized that each of the 44 holes for the fence would need to be dug the old fashioned way. Tony and Brian designed a removable fence – post system in order to be able to take off fence panels when moving the houses on wheels into or out of the lot. A 4 foot deep hole was dug to put the electrical pole into, per DC code and Tony and Brian installed a 20′, 6×6 electrical pole — tough lifting! Looks awesome, guys! Nice kicks, Tony!